And the words we think we know, well, they have very different meanings in the song: “waltzing” means to travel while working as a craftsman, learning new techniques from other masters, and then returning home three years and one day later; “matilda” is the swagman’s bundle containing his worldly possessions. So, no, the song isn’t about a guy swinging his gal Matilda around the dance floor. It’s about him traveling with his pack of possessions and learning his trade. But getting back to that “billy”…three guesses what it is…nope, nope, and nope! It’s a can large enough to hold 2-3 pints of water and used for boiling water scooped up from such unsanitary places as billabongs (small ponds or lakes formed when the rivers they were once part of change course). 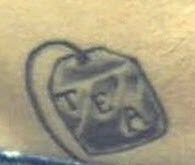 Funny and weird tea tattoo — you have to be quite a lover of tea (or have imbibed too much of something other than tea) to have a teabag tattooed on you; anchors and roses and your sweetheart’s name are more usual. 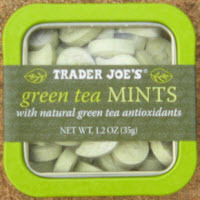 Green tea mints from Trader Joe’s – made of green tea (which one is unspecified) and peppermint and lots of sugar), tend to be crumbly and chalky according to some online reviews. I’d rather just drink the green tea and have a breath mint on the side. 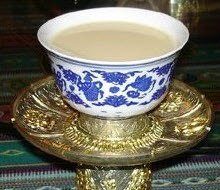 Yak butter tea — A yak butter lack can ruin tea time for Tibetans. And tea to them is consumed as abundantly as coffee is here in the U.S. They believe that yak butter in their tea makes their bodies strong, longer lived, warmer, less hungry, and better at digesting their food. Yak Butter Tea is made of water, brick tea, salt, and yak butter. Check our blog for more odd and offbeat tea items. Identical looking mints are available here in Australia in an identical pack but with a different brand. And yes, I have two billies,a standard 1 litre and a 2.5 litre one. I made a youtube video about four years ago of the smaller one in action. I figured this was more your area of expertise, but I just couldn’t resist! You might want to do your own approach to this here.